Adults chew “C” shaped notches in the margins of foliage. These notches tend to be fairly small (1/4”) and distinct. Black Vine Weevil (BVW) adults have long curved snouts and are black in color. The adults are most active at night and are seldom visible during the day. 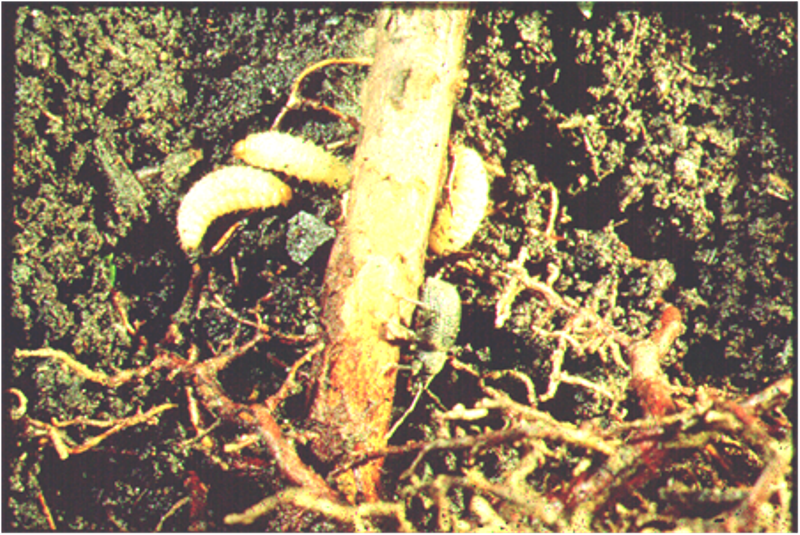 Weevil larvae feed on the roots and crowns of plants. The larvae are white, legless “C” shaped grubs with red/brown heads. They can be very difficult to find when digging under a host plant. Feeding damage by larvae may cause reduction in plant health, branch dieback, wilting, & sometimes death. 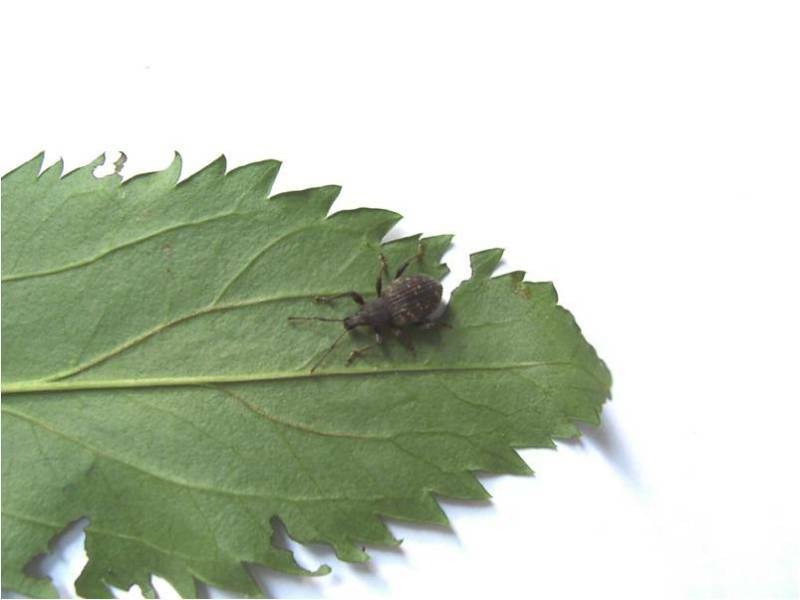 Probably the greatest reason landscapers struggle to control this pest is caused from poor timing of foliar sprays. Ideally, the foliar sprays are applied to reduce the aesthetic injury caused by adults & subsequently prevent large populations of larvae from developing. To optimize treatments it is important to understand that adults emerge to feed on leaves usually starting in late May to early June. The all female adult population requires a feeding period of between 3 to 4 weeks before they are capable of laying eggs to start a new generation. The first eggs are usually laid when growing degree days (GDD) numbers reach 1000 (around late June to mid-July depending on your location within NJ). Ideally, pesticides should be applied prior to 1000 GDD. After this point, adults begin laying eggs for the next generation. The best treatment window is therefore the period of time between the emergence of the first feeding adults and the 3-4 weeks that follow. One of the most successful management strategies has been to apply the 1st treatment when the first adults or feeding symptoms are observed and to follow-up with a 2nd treatment 2 or 3 weeks later. 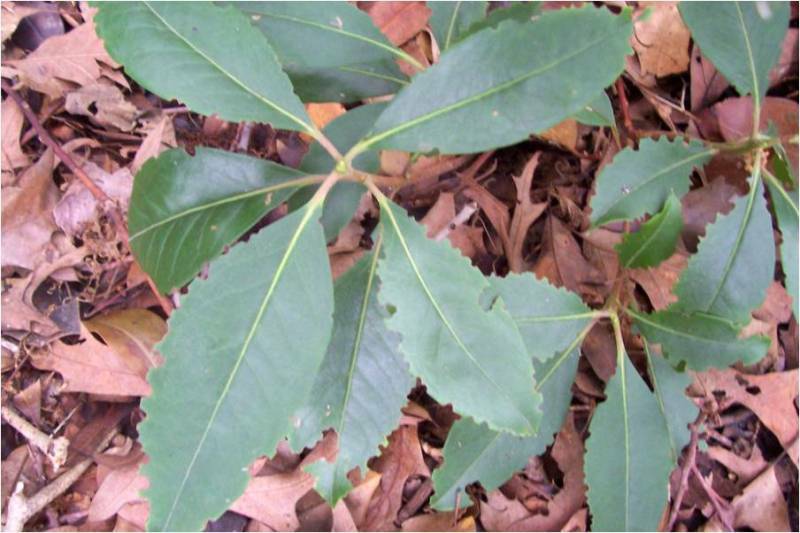 Synthetic pyrethroids such as Talstar (bifenthrin), Tempo (cyfluthrin), Astro (permethrin), & Scimitar (lambda-cyhalothrin) provide controls of leaf feeding adults and have relatively long residuals of 2-3 weeks. Beauveria bassiana is a fungal pathogen and is a low toxicity pesticide approach that can be effective with several repeated sprays. 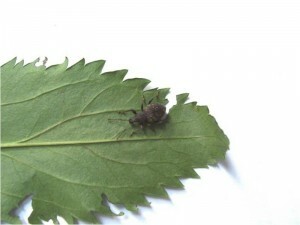 Generally, spraying foliage with an insecticide in early evening should provide best results since BVW adults are most active during the first few hours after sunset. Larvae may be killed with drenches of beneficial nematodes or Talstar (bifenthrin) during the summer and early autumn. Formulations of Talstar may provide season-long control when incorporated into potting mixes for container plants. The effectiveness of soil drenches of Talstar in landscape situations is questionable. Beneficial nematodes can be very effective against the larvae of black vine weevils. The use of beneficial nematodes has proven most successful in well-irrigated soil such as nursery containers. They don’t seem to be effective in hot planter boxes with sporadic irrigation or in heavy clay soils.